The Moon is associated with the zodiac sign Pisces. If you have been born between the 20th February and 20th March, then Pisces is your sun sign, and the Moon is your sun sign card. Depending on your year and time of birth, Pisces can also be your moon sign, and then the Moon would be your moon sign card. 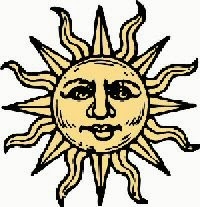 The sun and the moon sign of your birth chart offer insight in the conscious (expressive) and unconscious (hidden) personality traits. As a sun sign card, the Moon reflects your visible personality, how you express yourself and how you openly engage with people and the world around you. 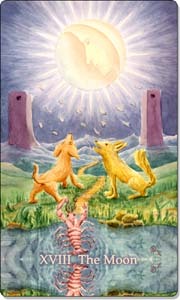 As a moon sign card, the Moon reflects that aspect of your personality you keep hidden or is blocked. The attributes of the moon sign are felt within you and reflect your emotional instincts and habits. Would you like to know more about your personal zodiac cards and what they might tell you about your personality? The Tarot can be used to provide a personality profile based on your astrological data. If you would like to receive your personal in-depth Tarot Personality Profile by email, you can order it on my website.